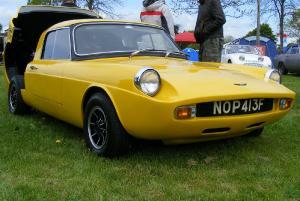 The Unipower GT is a Austin/BMC Mini based specialist sports coupe. Diminutive in size (especially when placed against a modern day saloon) the Unipower GT is just 40 inches tall and utilises the Mini Cooper engine in mid-engine configuration. Based around Mini mechanical components the Unipower GT uses a custom made space frame chassis to which everything attaches. Respected for its quality construction the Unipower GT is much in demand whenever one of it's 75 or so production cars come up for sale. The Unipower GT has excellent road holding and handling characteristics (much like the Mini) with excellent tuning potential using after market Mini tuning parts. Production continued for 4 years of this excellent car. Consider yourself lucky if you ever spot one.